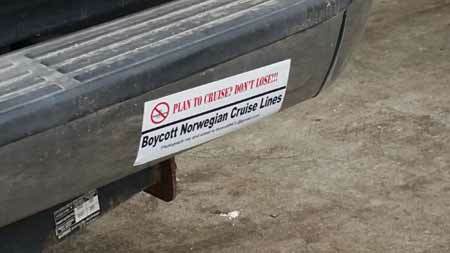 Today a campaign to Boycott Norwegian Cruise Lines was launched, and members of the public, especially cruisers, are being offered free bumper stickers to show their support and solidarity with the wildlife of Belize. People who take cruises love to travel and explore the world, just like other types of travelers. Many of Belize’s first-time cruise passengers fall in love with the country and return year after year as long-stay tourists. Sadly, recent reviews of Norwegian Cruise Lines’ Harvest Caye suggest that cruise passengers aren’t getting that warm fuzzy feeling about Belize anymore and that’s a bad thing for the cruisers as well as for Belize’s future tourism prospects. Not only is Harvest Caye a manufactured version of Belize, but it is host to a horrible animal side show featuring Belizean wildlife. The site is completely inappropriate, even for the health and welfare of captive-bred birds, but worse than that the toucans and macaws on display there came from the wild. There are only two ways that native Belizean birds end up in captivity. They are either stolen from the forests by poachers or they become ill or injured and are rescued for rehabilitation. All wildlife belongs to the people of Belize and the country’s wildlife laws are designed to protect wildlife from poaching and exploitation. Wild birds that require medical care or are recovered from illegal captivity are carefully assessed by experts for possible return to the wild. Big Red, one of the young Macaws currently at Harvest Caye, was under such an assessment, and there were plans in place for his journey back into the wild. 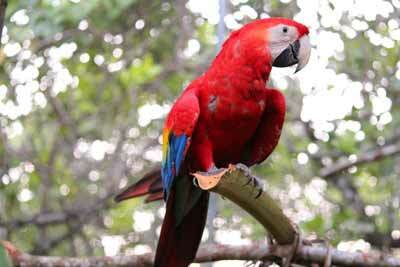 The releasing Big Red was particularly important as scarlet macaws are extremely rare in Belize. Poaching and habitat destruction has reduced the Belizean population to just a few hundred macaws. Not every bird is suitable for release like Big Red, so those birds make their home at the unique and wonderful conservation and education center, The Belize Zoo. Thousands of Belizean children and adults visit them there, where they are part of a programme to educate and raise awareness about the amazing rain forests of Belize. On request, conservation groups advised Norwegian Cruise Lines how to operate a wildlife education center that would be informative and fun for their customers, but the cruise company opted to do something so dreadful that no one could have anticipated it. While the Chief Forest Officer was out of the country, Big Red and another scarlet macaw were secretly whisked away and given to Norwegian Cruise Lines to be displayed along with four toucans – Belize’s National Bird. All of these birds came from the wild. All of these birds belong to Belize and to Belizeans. Now they are in cages on a salty, windswept island, permanently captive for display to cruise ship passengers. Belizeans are not permitted to visit them. No official explanation has been given as to how or why this happened. Nor can anyone pin point who was ultimately responsible for making this happen. If it all sounds deeply suspicious to you, it probably is. This is why a coalition of conservationists and activists have banded together to launch the Boycott NCL Campaign. It’s easy to participate in, it’s fun and it’s for an excellent cause. All you need to do is send your address to [email protected] and you will receive a free BoycottNCL bumper sticker in the mail. In return, you’re asked to email back a photo of your vehicle sporting the BoycottNCL bumper sticker so that it can be sent to NCL and featured on the Boycott NCL Facebook page. NCL need to understand that what they are doing is NOT acceptable! If you cruise, don’t lose. If anyone would like to show their support for the Boycott NCL Campaign, write to us at [email protected] with your address and we will send you a free bumper sticker. All we ask in return is that you send us a photo of your bumper sticker on your vehicle. Bicycles, golf carts and other types of vehicle are most definitely welcome to participate. Great article by Taco Girl. The campaign has featured in the San Pedro Sun, Channel 7 News, Breaking Belize News and people from all over the world are ordering bumper stickers. Some interesting questions have been asked about this campaign and we believe interesting questions deserve good answers. So here is a little question and answer post to help you better understand why this is so very important. Consider this your very own Boycott NCL FAQ. Feel free to copy, paste and share. 1. How were the birds or other critters (the rare or protected or nationally symbolic ones in particular) acquired in the first place? The toucans were a ‘gift’ from a private individual that had the birds for several years. How he got a licence is unknown: toucans are not covered by the recent captive wildlife licence programme for legally grandfathering in captive parrots. Harvest Caye (the Island) have an FD permit to keep 4 toucans. Permits are non-transferable; therefore if the original owner had a legal permit from FD, the transfer had to be done under permit by the Forest Department. We have reason to believe that one toucan has already died and that two more replaced that one. If this is the case, they already have more toucans than permitted. One of the macaws (Rosey) was confiscated from the illegal pet trade by Forest Dept and taken to the Belize Wildlife and Referral Clinic. Apparently the bird has lost the tip of one wing – either by accident or human design - cannot fly and is therefore not releasable. Non-releasable macaws have always gone to The Belize Zoo to form part of their education programmes and as ambassadors and fundraisers for Friends for Conservation and Development (FCD)'s work in the Chiquibul. No-one other than FD or the Wildlife Clinic knew of the existence of this bird. No opinion was sought over the disposition of the bird. Rosey was ‘kept’ in the care of the Clinic founder/director Dr Isabelle Paquet Durant. Dr Durant is also a founder/director of the Harvest Caye Conservation foundation who is responsible for the birds on the Caye. The other macaw (Big Red) was also confiscated but on this occasion, Belize Bird Rescue (BBR) was providing logistic, handling and assessment support during routine licence inspections. As a result, the bird came to BBR for care and rehabilitation and assessment for whatever disposition was eventually determined based on physical and mental suitability. This is completely normal and routine for every species of parrot: macaws are parrots and it was seen perfectly reasonable that an outwardly healthy young macaw should go to BBR as the Government of Belize’s designated psittacine rehabilitation centre. Big Red was being held pending testing for any virus or infections that would have precluded re-release to the Chiquibul. He was less than a year old and outwardly healthy. BBR was prevented from the then Wildlife Officer and Dr Durant from carrying out standard tests via a lab in the UK . BBR was told by both of these people that CITES prevented samples from being dispatched without permit: this is absolutely false – blood and serum samples for lab testing is not considered as a recognisable part of the bird and therefore is exempt from such legislation. Dr Durant insisted on acquiring permits and then failed to find anyone outside of Belize prepared to apply for the appropriate import permits. In the 7 months Big Red was at BBR, no tests were ever done, so we have no idea if he would have been a suitable candidate for rehab for release. As a result, a perfectly healthy juvenile wild macaw is now in permanent captivity for the remainder of his natural life – which should be anything up to 80 years and beyond. 2. Where were they living and who was looking after them prior to their relocation? Big Red arrived at BBR on October 25th 2016. Rosey apparently arrived at the clinic in March 2017. Both birds were transferred out to Harvest Caye on May 23 2017. We have no idea where Rosey was actually being kept. We can't find anyone who observed Rosey whilst visiting the Wildlife Clinic which makes us think she was kept at Dr Durant’s home. This is just speculation though. BBR cared for Big Red. He was quarantined for in a screened room for 40 days, then put into a large outdoor enclosure by himself pending these ‘tests’ which would determine if he was clear of disease and releasable. 3. Who let the resort management people or their agents have the birds and other critters for the exhibit? This is 100% Belize Forest Dept. (FD) No-one else has the authority to transfer birds in this manner. The birds are the property of FD, whatever the circumstances – and they can do exactly as they please with them and we have no power to prevent them removing the birds. 4. Were they purchased outright and, if so, is that legal and who benefited financially from the sale? We have absolutely no idea – no discussion or dialogue was entered into by FD with their mandated avian wildlife partners of 11 years. 5. If this was obviously wrong at the time, (is it wrong, or are there loopholes in the laws?) why was nothing done then to stop this? Refer to 2 and 3a. And believe us, objections were raised. But BBR were given less than 2 hours from notice to removal to prepare the bird for transport. Not only was this unethical, it is inappropriate and detrimental to transfer a wild bird in such a rushed and unplanned way, and against all protocols (BBR’s and international standards). There was no discussion, interaction, opinion or consultation with BBR or any of the other wildlife partners and expert panels put into place by the FD themselves to prevent exactly this kind of thing happening. 6. Who or which organization is now looking after the animals at the site? Harvest Caye Conservation Foundation are responsible for the macaws. There are 4 founder-directors: Dr Durant, Mr Trejo, Mr Garel and Mr Belisle. We have documentation to support this. There is no legal entity responsible for the toucans, snakes, iguana and butterflies. Harvest Caye no longer exists as a Belizean Company – they were removed from the Register in 2016. Therefore, it would seem FD’s permit to Harvest Caye is no longer valid as the entity is no longer in existence. We assume that Mr Garel is caring for them - he is the Harvest Caye animal manager. We understand that the facility is not staffed on weekends so we have no idea who cares for them then or how. 7. Directing a boycott activity toward a large corporation is one thing and there may be some elements of that action that have success. Certainly, raising awareness about owning rare or protected birds or other critters is good... However, stopping the action in the first place -- in other words, someone saying "...no, you can't have this macaw, and here's why..." would have been a better, but likely more challenging, course of action. No one was given any opportunity to do so – and FD did this because they knew it would be challenged and they were unlikely to pass those challenges. This is NOT the first time something like this has happened, which is why we are so determined that it will not be allowed to pass without challenge this time. Otherwise, what's to stop other foreign companies staring their own animal side shows for profit. 8. 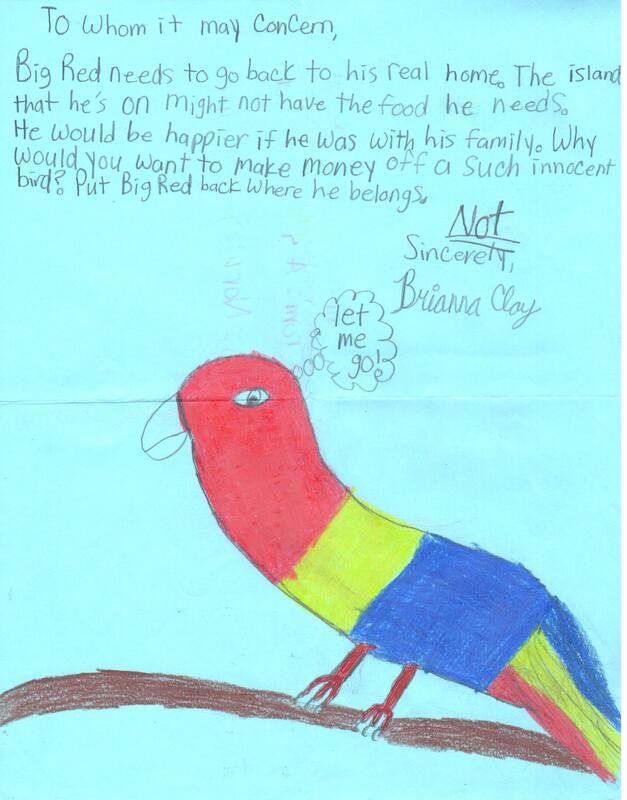 In the meantime, if the big birds are removed from Harvest Caye, where will they go? The list of objections to this operation is extensive. The guise of Harvest Caye Conservation Foundation is a smoke-screen for corporate greed on several levels involving the Wildlife Institute – a study-abroad business operated by the directors of the Wildlife Clinic, and by Norwegian Cruise Lines – a for-profit industry with a track record of environmental disregard. NCL had alternatives. Good alternatives. They chose to go this route and they must bear the brunt of the consequences. This is NOT just going to go away. As we all are trying to help those devastated in the Caribbean by Hurricane Irma and are anxiously watching the storm approaching Florida, we think about what would happen to those poor wild animals, being kept for profit on Harvest Caye by Norwegian Cruise Lines. As you all probably know, the coast of Belize is particularly vulnerable to hurricanes and tropical storms. As we understand, the plan they have put into place is to evacuate the animals onto the property of one of the founders of the Harvest Caye animal side show, which requires many miles of travel. This would have to be done well in advance of any storm as Harvest Caye would be evacuated of all people and there would be no one left to care for the animals. According to some of the leading experts on captive wildlife, what we’re seeing in Florida is the best model for the welfare of the animals. They have proper facilities on site with staff to care for the animals in situ as the stress of moving the wildlife to another site would prove more dangerous to the animals than the storm itself. In a statement Wednesday, the Miami Zoo said it would not evacuate animals "since hurricanes can change direction at the last minute, and you run the risk of evacuating to a more dangerous location." “The stress of moving the animals can be more dangerous than riding out the storm," the zoo said on its Facebook page. This wouldn’t be possible for the animals on Harvest Caye. There is no safe shelter for them there and no one will stay there to care for them. This is yet another reason that keeping wildlife on Harvest Caye is absolutely wrong. Return the Belizean wildlife to Belize where it can be cared for properly! We've started our first NCL Challenge. If you'd like to participate, as a class of 4th graders have, please see the information below. Sometimes it's best to just laugh when dealing with an company like Norwegian Cruise Line. We believe you can laugh AND make a difference. So, today is our first NCL Challenge. Are you up for it? It's simple, but challenging. Make sure to share with your friends on Facebook so we can really have fun with it. Today's NCL Challenge is to see who can get the best/most interesting/most entertaining response from NCL about their animal side show at Harvest Caye by any means possible. When we say 'by any means possible', we mean it. So, use Facebook, email, Twitter, call them, write to them, even talk to them face to face and ask them WTH they are thinking? We still haven't gotten a rational or reasonable response from them, so why not just go for the ridiculous? We are excited about this challenge and we hope you are too! Use the comments section here to brainstorm, share your ideas for doing this and, even better, to conspire. We know that people who love animals are some of the most creative and funniest people around, so we can't wait to see what you come up with! Some of the most respected and eminent individuals in conservation from around the world have heard about what Norwegian Cruise Line is doing with our Belizean wildlife on Harvest Caye. We are proud to have received this letter of support from Lee Durrell, conservationist and biologist, whose late husband, Gerald Durrell, the British author, naturalist and founder of one of the most influential conservation organisations in the world, Durrell Wildlife Conservation Trust. Please allow us to share it with you and we ask you to share it with your friends and colleagues. I write as someone who loves Belize and its biodiversity. I have travelled the world as a biologist and a conservationist, and I very much applaud the efforts of the people and the Government of Belize to protect the extraordinary natural heritage of this special country. I have recently been informed of the current situation at Harvest Caye with respect to the cruise tourism company, Norwegian Cruise Line (NCL). I was disturbed to read of allegations of drug smuggling and distressed to hear of the tragic death of a rare manatee, apparently due to irresponsible boating practices by NCL. What I am moved to comment on, however, is the situation with captive animals at the Harvest Caye tourist facility. I came to Belize in the 1980s with my late husband, Gerald Durrell, the British author, naturalist and founder of one of the most influential conservation organisations in the world, Durrell Wildlife Conservation Trust. Since his untimely death in 1995, I have returned to Belize several times to witness the development of a number of positive conservation initiatives: Belize Zoo and Tropical Education Centre, Programme for Belize and various excellent animal rescue and rehabilitation facilities. 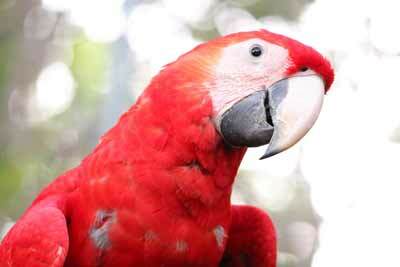 I have noted the work to protect the scarlet macaw, which is threatened in Belize. Aware of great progress on many conservation fronts, I was troubled to learn that NCL is in the process of establishing a facility for captive animals to entertain cruise ship tourists at Harvest Caye. Apparently, two scarlet macaws andseveral keel-billed toucans (the National Bird of Belize) are being used in this way. It is my understanding that one of the scarlet macaws, “Big Red”, had been a prime candidate for release back into the wild. However, the bird was removed from the bonafide rescue and rehabilitation centre, Belize Bird Rescue, and transferred to Harvest Caye, without full health checks, for the amusement of tourists. Having participated in numerous conservation initiatives around the world setting upboth captive and wild populations of rare species, I question the protocol followed in the relocation of „Big Red&#8223;. Clearly it did not adhere to the well-established guidelines developed by the International Union for the Conservation of Nature (IUCN) and now followed by all serious conservationists. I am highly doubtful of the credentials, expertise and intentions of NCL to serve the interests of Belizean biodiversity. Surely the conservation and welfare needs of wild animals should be discussed and determined by government authorities and those mandated by them to advise on such matters. Otherwise, the reputation of Belize as an exceptional ecotourism destination will be severely weakened. In closing, I hope the matter is resolved soon, not only for the sake of the birds held at Harvest Caye, but also to show the world that Belize exemplifies responsible stewardship of its precious biodiversity.